Legislative mischief, because the republican super majority can. That pretty much covers everything and anything. (27) Effectively eviscerates the Missouri Sunshine Law, and is an attempt to let the Missouri General Assembly off the hook for the transparency required by CLEAN Missouri – Amendment 1 – which was overwhelmingly approved by voters in November. Greg Razer is at Missouri House of Representatives. House Republicans just voted to gut the Sunshine Laws as it relates to the General Assembly. The underlined sections in the amendment below is a change to the law. Section (25) is perfectly fine. Section (26) is not great, but one could argue for it. However, in particular take a look at (27). Read this closely. 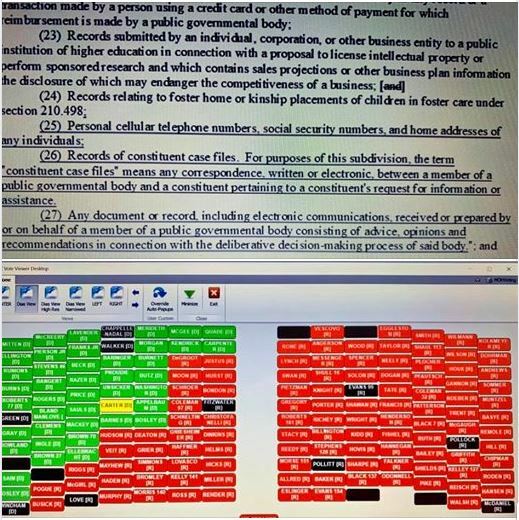 ANY document, including emails, that contain a legislator’s opinion would be allowed to be hidden from the Sunshine Law. Folks, virtually every email I send contains my opinion in some form. This section, (27), therefore guts Sunshine as far as the General Assembly is concerned. No transparency. Because they can. 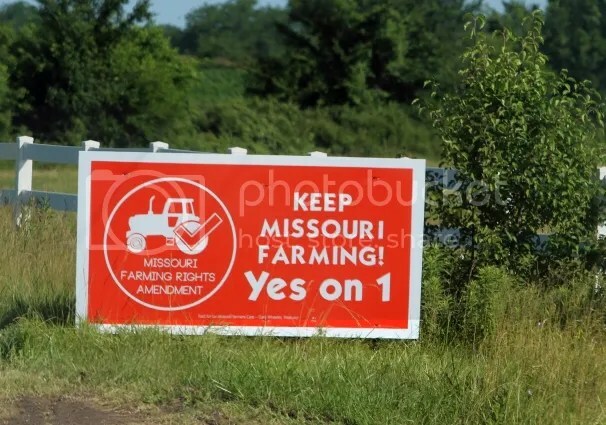 4 x 8 signs promoting the “right to farm” amendment to the Missouri Constitution are popping up like mushrooms across the rural landscape. As if family farms are under some sort of existential threat from public sentiment or government overreach? It’s probably got something to do with puppies! Uh, yep. Thumbing their nose at the establishment – along a highway in west central Missouri. For those keeping score at home, Roy Blunt isn’t showing anyone that he has real ideas about energy policy or how to deal with climate change. An amendment he offered to the American Clean Energy and Security Act, the big cap-and-trade bill making its way through the House right now, was rejected in committee today. The amendment would have installed a self-destruct button in the cap-and-trade system if electricity rates rose. Well, electricity rates could rise purely on account of increased demand from an economic recovery. Should we install a self-destruct button on that, too? The point of cap-and-trade is to make carbon emissions pricier and to reward efficiency and clean energy generation. This may mean temporary price increases, but it will also lead to cleaner and more stable sources of energy with fewer external costs related to energy generation, like respiratory disease. And the ACES, the legislation Blunt was trying to kneecap, actually allocates rebates to Americans to provide a buffer against any price spikes. Back to Roy’s poison pill, electricity rates are rising all on their own. And other coal heavy states like Ohio and Virginia are seeing their rates rise quickly, despite their reliance on “cheap” coal. Perhaps he could legislate a self-destruct button on any energy company that raises rates for any reason over a short period of time.